Hypercholesterolemia is an important risk factors of atherosclerosis. Bitter leaf is believed to have potency in decreasing plasma lipid. 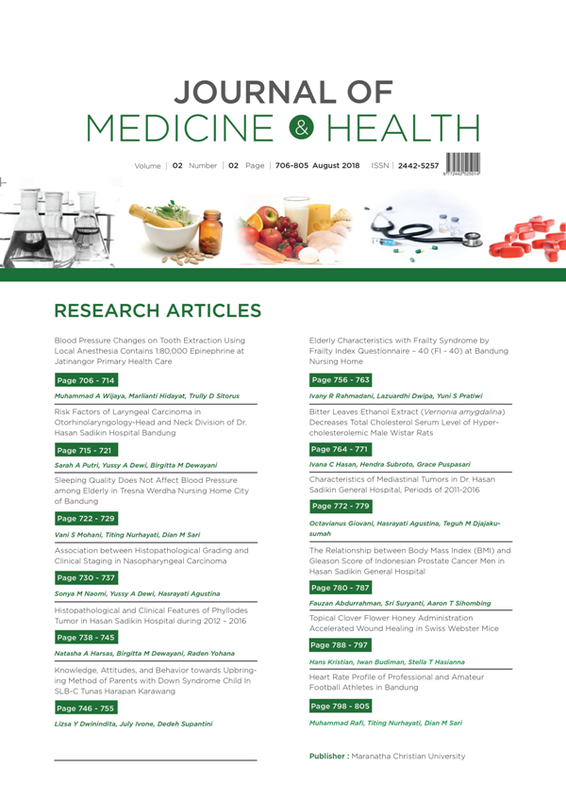 The aim of this study is to study the effect of bitter leaf ethanol extract in decreasing total cholesterol serum levels on hypercholesterolemic male Wistar rats. This is a true experimental laboratory study with complete randomized design. Antidyslipidemia effect was tested with HFF induction and Propiltiourasil 0,01% towards 30 rats which were divided into 6 groups: groups I as normal control (standard diet), groups II, III, and IV were given bitter leaf ethanol extract of 100 mg/kgBW, 200 mg/kgBW, and 400 mg/kgBW dose, group V as positive control group with Simvastatin, and group VI as negative with aquades. HFF Â were given for 14 days then the study was continued for 14 days. The percentage data of the declining total cholesterol levels before and after treatments is analyzed with ANAVA, continued with LSD test. The result between group II, III, and IV with group VI shows a significant difference p<0,01. We concluded bitter leaf ethanol extract can decrease the level of total cholesterol serum of hypercholesterolmic Wistar rats. Widyaningsih W. EEfek Ekstrak Etanol Rimpang Temugiring ( Curcuma heyneana Val .) terhadap Kadar Trigliserida. J Vet. 2011;1(1):55â€“65. Oluwatosin A, Akintayo O, Achem J, Michael AF. Lipid-Lowering Effects of Methanolic Extract of Vernonia Amygdalinaleaves in Rats Fed nn High Cholesterol Diet. Vasc Heal Risk Manag. 2008;4:1. Arief M, Novriansyah R, Budianto IT, Bimo M, Harmaji. Potensi Bunga Karamuning (Melastoma malabathricum L.) terhadap Kadar Kolesterol Total dan Trigliserida pada Tikus Putih Jantan Hiperlipidemia yang diinduksi Propiltiourasil. J Prestasi. 2012;1(2):118â€“26. McRae MP. Vitamin C supplementation lowers serum low-density lipoprotein cholesterol and triglycerides: a meta-analysis of 13 randomized controlled trials. J Chiropr Med. 2008;7(2):48â€“58. Sunarsih E sri, Pamuji S. Pengaruh Pemberian Vitamin C terhadap Kadar Kolesterol total Serum Tikus Jantan Hiperlipidemia Setelah Perlakuan Jus Lidah Buaya (Aloe vera Linn). J Pharm. 2007;5(2):120. Atangwho IJ, Ebong PE, Enyong EU, Williams IO, Eteng MU, Egbung GE. Comparative Chemical Composition of Leaves of Some Antidiabetic Medicinal Plants: Azadirachta Indica, Vernonia Amygdalina and Gongronema Latifolium. African Journal of Biotechnology. 2009; 8(18): 4685-9.